Farmers are facing both falling corn prices and declining demand after the nation ended in March a corn stockpiling program in some areas, as it looks to other subsidies. In order to bolster competitiveness, China urged more supply-side reform among producers in the agricultural sector. Experts said that transparent disclosure is needed to reflect actual market status. In the first corn harvest since March, when China reformed its corn stockpiling program in some areas of the country, farmers are facing both falling corn prices and demand, according to media reports. 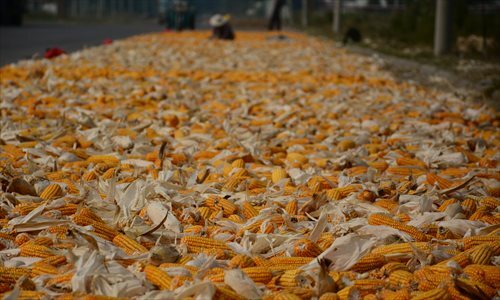 The National Development and Reform Commission (NDRC), the country's top policy planner, announced in March that the State will end its corn stockpiling program this year, as it looks to other subsidies, Xinhua News Agency reported then. Under the new policy, the government encourages State-owned and private companies to buy corn at market-based prices. In 2007, China instituted temporary corn stockpiling programs in Northeast China's Liaoning, Jilin and Heilongjiang provinces, as well as in North China's Inner Mongolia Autonomous Region, with the aim of protecting farmers' incomes, stabilizing the market and ensuring national food security. But with growing structural contradictions between food supply and demand, the domestic corn supply has gone into surplus, Xinhua reported. The three provinces in Northeast China are the country's largest areas of grain production, accounting for nearly a quarter of the crop's total national output, according to media reports. But since the cancelation of the stockpiling program, the market is still relatively small and farmers are incapable of storing large amounts of corn, experts said.They noted that the country must do more to promote market circulation and reduce production costs to improve competitiveness in the international agricultural market. During an inspection tour of Jilin on Thursday and Friday, Vice Premier Wang Yang called for more work to reform the supply-side structure in the agricultural sector, according to a statement posted Friday on the central government's website. Some companies have begun buying new harvest corn in Northeast China. For instance, the average purchase price of corn from ethanol companies in Jilin is 1,450 yuan ($217.44) per ton, and the price from companies in Kaiyuan, Liaoning, is 1,570 yuan per ton. Prices in both areas have plummeted from a year earlier, according to a report Saturday from Beijing-based Outlook Weekly magazine. In 2014, the corn purchase price rose to 2,200 yuan per ton in Heilongjiang, from 1,380 yuan per ton in 2007, the magazine reported. In 2015, corn purchase prices fell for the first time to 2,000 yuan per ton, but were still higher than imported corn, according to the report. Imported corn from the US sells on average for around 1,500 yuan per ton, according to a September report from the CME Group, one of the world's largest derivatives exchanges, based in Chicago. In the past several years, the government bought corn at prices well above market rates in a bid to encourage Heilongjiang farmers to increase output, Xinhua reported in September. As a result, most of the corn was purchased by the State, and only a small portion entered the market, Xinhua reported. Experts predicted that, after the end of the State stockpiling program, the amount of corn traded at market prices will rise gradually. Corn prices fell not only in Northeast China, but also in North and South China, the Outlook Weekly reported. Large amounts of corn produced in North and Northeast China have entered the market. With the growing supply, domestic corn prices will continue to fall, the report noted. The cancelation of the stockpiling program and fixed market prices have strengthened expectations that domestic corn prices will fall further, Outlook Weekly reported, citing Cao Zhibiao, director of the market monitoring department at the National Grain and Oils Information Center. Major grain purchasers are holding off on buying corn amid concerns that they won't be able to sell in time without the State's purchasing program, the magazine reported. "We were not worried about the market before, because we could sell corn we've bought from farmers to the State-owned China Grain Reserves Corp," Xie Mingdeng, general manager of the Xinhang Grain Trade Co in Heilongjiang, was quoted as saying by the Outlook Weekly. "Now we're focusing on the rice purchase." A Beijing analyst agreed. "Indeed, some grain-trade companies have concerns over the corn market without the State's support," Ma Wenfeng, a senior analyst of Beijing Orient Agribusiness Consultant, told the Global Times. "They have to take the risk themselves now in facing price fluctuations," Ma said. "But for those corn-processing companies that are in need of raw material, they still have to purchase corn." In order to stabilize the market, the government announced in September that corn purchases will be implemented well under the new mechanism in the northeast regions. Many experts said that the adjustment will directly impact grain prices in the whole country, as well as security of the national grain reserve. Experts suggested that the country needs to encourage State-owned grain companies to be major purchasers. They also floated the idea that the State should accelerate the auctioning of corn stocks to clear space before the harvest seasons start, according to Outlook Weekly. Private grain companies also need to innovate and seek more channels to expand their market, the report said. "The country also can improve the mechanism to follow the average corn price in the market, to better reflect the market status and provide subsidies to the farmers directly, which is a good way to protect farmers' incomes," Ma noted.